LILONGWE, Jan 22 2013 (IPS) - She has taken a personal pay cut, promised reforms, resumed aid flows from Western donors and put her predecessor’s private jet up for sale. Malawi’s president Joyce Banda seems to be making all the right moves to win over the hearts and minds of this impoverished southern African nation’s roughly 14 million people. With over 65 percent of the population living below the poverty line, 1.4 million children involved in child labour and 74 percent of the country scratching out a living on less than 1.25 dollars a day, Malawi is desperate for change, and Banda has been the face of it for nearly a year. Riding on a groundswell of popular support, the president came into office in April 2012 after the sudden death of her mercurial predecessor, Bingu wa Mutharika; but that popularity is eroding fast as she implements painful austerity policies to fix a sputtering economy. The aid-dependent country teetered under the late Mutharika, whose squabbles with international donors led to a freeze in major assistance packages amounting to about 500 million dollars. The cut in aid, which has traditionally accounted for 40 percent of the country’s budget, coincided with a steady decline in tobacco sales, Malawi’s main export earner, which have gone down by more than 50 percent since 2010. In an attempt to pull the economy from its slump, Banda embarked on a range of reforms, few of which have found favour with the local population. Perhaps her biggest gamble has been to cultivate closer ties with international financial institutions like the International Monetary Fund (IMF), whose heavy-handed austerity plans have recently come under fire in countries like Greece, Ireland and Spain. In fact, experts here say that the high-level visit early this month by IMF Chief Christine Lagarde may have done more harm than good for Banda’s waning popularity. Already the president has capitulated to unpopular reforms demanded by the IMF and other Western donors on whom Malawi is heavily dependent, such as devaluing the currency by 49 percent, increasing petroleum prices three times in her presidency and cutting off subsidies by moving to an automatic fuel price adjustment mechanism. These reforms have had devastating domino effects on the country’s poor, affecting people like Shadreck Kumwembe, a primary school teacher who earns less than a dollar a day. “My real income has halved in the last few months because of the devaluation, and yet food prices have been going up — I can’t afford to pay for everything,” Kumwembe, who also disclosed that he has not received his salary from the government in the last three months, told IPS. Commodity prices have soared and pushed inflation to 33.3 percent in December – far higher than the government’s forecast of around 18 percent for 2012. The latest data from the Centre for Social Concern, a local research institution focusing on the cost of living in urban Malawi, showed that since Banda took over, a family of six now needs an average of 200 dollars per month to meet basic food demands – bad news in a country where the minimum monthly wage is about 20 dollars. On Jan. 17, just a few days after Lagarde’s visit, thousands of Malawians took to the streets peacefully in all three major cities of the country for the first large-scale protests under Banda, against what they described as “the IMF’s wrong economic prescriptions”. “I blame IMF policies for all these high prices and job losses we are experiencing. Lagarde’s insistence that Malawi continues on this path underlines how out of touch the IMF is with reality,” said James Chivunde, a civil servant who joined the protests last week. “Late President Mutharika refused to listen to them (IMF) to devalue the kwacha (the local currency) because he knew exactly how that was going to impact us,” Lloyd Phiri, another protestor, told IPS. According to John Kapito, head of the watchdog known as the Consumers Association of Malawi, Banda has “transferred power” to the IMF and the World Bank. “Like many leaders of poor countries, the problem with Joyce Banda is that she doesn’t think on her own. She is listening to everything that the IMF and the World Bank are telling her. She (agreed) to devalue the kwacha, agreed to remove subsidies on fuel without considering the impact of these decisions on the poor,” said Kapito, who helped organise the latest demonstrations. Meanwhile, the IMF is adamant that the only way out of the cycle of poverty is for Malawi to continue to abide by the Fund’s prescriptions. “There have been huge efforts undertaken by the Malawian government and the Malawi population and it is really important to stay the course,” Lagarde said during a press conference held in the capital Lilongwe on Jan. 5. She assured that the country is at a tipping point, that soon inflation will start dropping and prompt the Reserve Bank of Malawi (RBM) to revisit the base lending rate. “Investors will return and we are confident that growth will resume,” she added. Some local economic experts are inclined to agree with these sentiments. 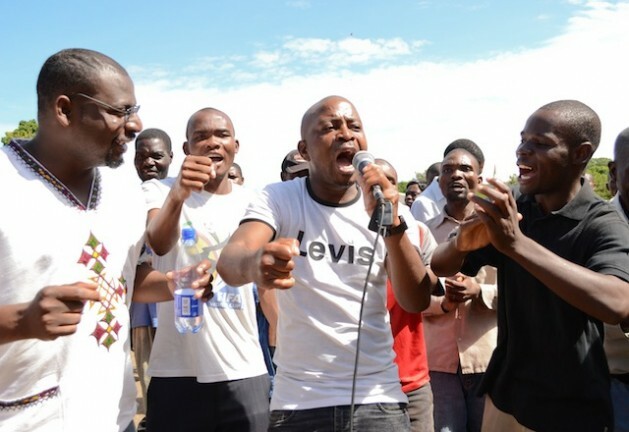 “There will be no quick fixes, but any U-turn from the current course will be disastrous,” said Ben Kalua, professor of economics at Chancellor College, part of the University of Malawi. “What is needed is a credible and consistent policy aimed at making economic growth more inclusive by ensuring the development and protection of social safety nets and expanding access to financial services so that everybody, including the poor, has access to credit,” he said. Executive director of the Malawi Economic Justice Network, Dalitso Kubalasa, also backed the IMF and blamed the late Mutharika for delaying implementation of economic reforms. “We are now paying the cost of the previous administration’s (policies) but we have to stay the course to (solve) the economic problems,” Kubalasa told IPS. While admitting that the government underestimated the impact of austerity policies on the masses, Finance Minister Ken Lipenga stressed that donor support is enabling the government to implement a fiscal budget that provides adequate resources for the delivery of social services and to increase resources allocated for cushioning the most vulnerable. “We have introduced food for work programmes aimed at assisting the poorest in our communities to cope with the unintended effects of the reforms,” Lipenga told IPS. But Banda’s waning popularity may affect successful implementation of the reforms as she prepares for an election next year. Her biggest test will come when the parliament convenes in February, when she will be forced to reckon with the fact that many members of her governing party are losing faith in her leadership.